As a former Girl Scout I’m feeling some internal conflict between that voice that keeps reminding me to “Be Prepared” and my current efforts to simplify my life. 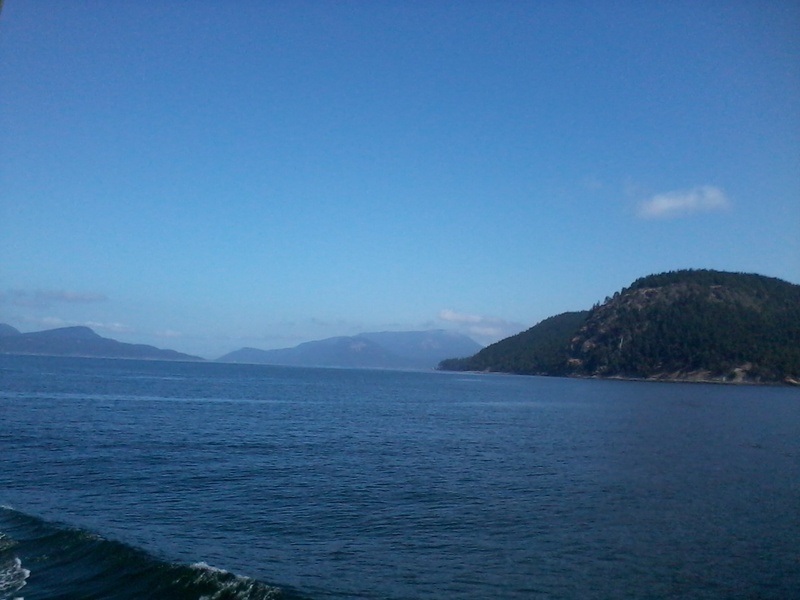 GF and I are vacationing on Orcas Island, one of the San Juan Islands off of Washington State. We can see Canada across the water. We are having a wonderful time in this beautiful place and learning a lot about HOW to vacation. The first new rule is, “If you want a quiet, relaxing time, don’t bring the old neurotic dog on a car trip”. I brought along a half-finished knit blouse for the 1000 mile drive from the Bay Area to Orcas. On the way up we took a few detours off of Interstate 5 and the scenery was so entrancing that I really didn’t have time to knit. Starting with the ferry ride from WA to Whidbey Island and then the longer ride from Anacortes to Orcas Island, knitting fit my mood. Slow down from the urban scene, slow down from driving 70 mph and just knit. Erin Endicott’s beautiful quote “One stitch at a time, hour after hour…. this is where the healing lies,” kept coming back to me. Slow down, take another stitch and enjoy that my hands can make clothes for my body, adornments for my house, gifts for my family and friends. Simplify and be healed. Immediately upon arriving in the San Juans I was struck by “Packer’s Regret”. (Yes I made up the syndrome.) I packed simply but WHY hadn’t I brought a peg loom? The irregular shapes of islands and clouds breaking up the blues of the water and the sky; the scenery just called out to become a little tapestry. Yes, I either would have had to bring bags of different color yarns or else I would have had to know in advance that I needed browns and blues and grays and whites, but that didn’t diminish my packer’s regret. Failing as a Girl Scout, I wasn’t prepared. I didn’t bring what I wanted to have fun on this vacation. So I knit and took pictures of the islands and tried to feel like I would do the tapestry when I got home, but life didn’t feel simple because I packed minimally and then wasn’t prepared to do what I craved. Today we took a drive along the west end of Orcas and stopped at Warm Valley Orchard which we had seen earlier as we were driving in from the ferry. Owner Maria Nutt was not there, but her charming daughter showed us the studio filled with roving, handspun yarn from local and purchased fiber, and beautiful handwoven textiles. Daughter Mara has been spinning since age 6 and was casually spinning a fine merino yarn while we visited. She explained that their Romney Cross have such long locks that they have to cut the locks in half before sending them to the mill for processing. They are now starting to raise Corriedale which have a shorter staple length (and seem softer to my touch). I bought one bag of each type of roving to experiment. Packer’s Regret hit again. As we packed I had looked at a beautiful little handcrafted drop spindle and thought about bringing it, but it was sitting at home and here I was stuck on a island with all this fiber and no way to play with it. What’s a Girl Scout to do? nights ago perusing a stack of weaving magazines from the ’80s, I saw a photo of a Peruvian elderly man spinning on a stick. No wheel, no whorl, no drop spindle, just a stick. Walking out of the cabin I found a broken piece of wood. It looks like it might have once been trim. I drafted out a bit of the Romney fiber and tied it onto the end of the stick. The roving drafted beautifully. There were the rare nebs and VM, but that doesn’t matter much when you are moving slowly. I drafted a few inches at a time and then experimented with twisting the roving in my left hand versus turning the stick in my right hand to instill the twist. Every 2 inch segment needed to be wound onto the stick and then I drafted another couple inches. It was slow, but very satisfying. I was making yarn. Maybe “Be Prepared” doesn’t mean bring every little last thing I might want with me. Maybe it means be prepared to find joy and satisfaction with what I have; a simpler life. 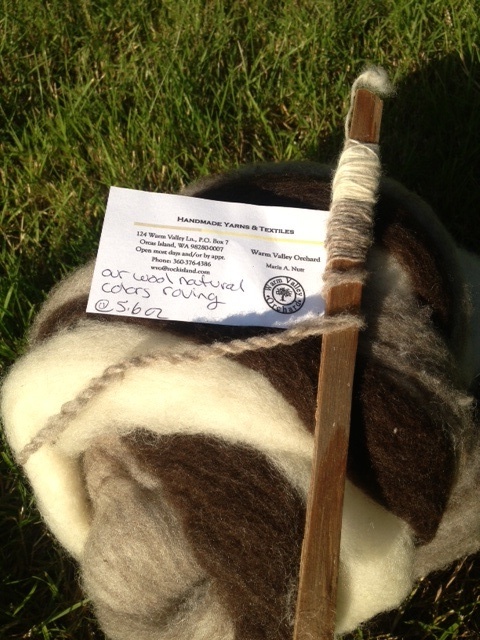 This entry was posted in Life, Spinning and tagged Orcas Island, spinning, yarn. Bookmark the permalink.